I was recently asked to learn about local ticks & diseases by my pals at Seresto. 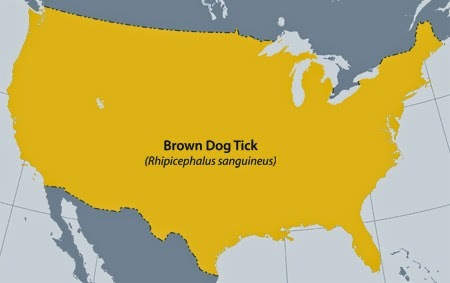 The Brown Dog Tick is in all of the United States, not counting Alaska. It is even in Hawaii. The Brown Dog Tick can transmit Rocky Mountain Spotted Fever. Naturally there are several more types of ticks and diseases to worry about in my area, the Southeastern United States. According to the CDC, there are at least 5 disease transmitting species of ticks in my area. In addition to the Brown Dog Tick, most of the Southeastern United States also has the American Dog Tick, the Black Legged Tick, and the Lone Star Tick. The American Dog Tick can transmit Rocky Mountain Spotted Fever and Tularemia. The Black Legged Tick can transmit Anaplasmosis, Babesiosis, and Lyme Disease. The Lone Star Tick can transmit Ehrlichiosis, Tularemia, and STARI. 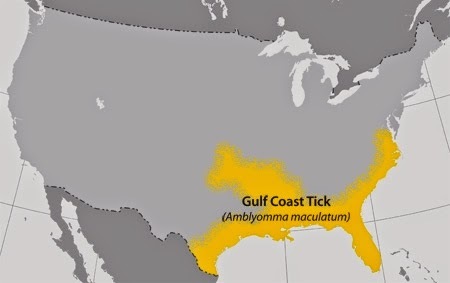 Those of us in the southern coastal areas also have to worry about the Gulf Coast Tick which can transmit Rickettsia Parkeri (a type of spotted fever). I don't know exactly what all of those scary sounding diseases are, and I don't want to learn about them the hard way. I plan to avoid meeting any ticks in furson. Ticks like to live in leaf clutter, so a clean yard is a good way to discourage them from living in your yard. The CDC also recommends lawn pesticides to kill any ticks that are already in your yard. When you're as fluffy as I am, finding a tick hiding in all of that fur isn't easy. Mom has to use both hands to spread enough fur apart so she can see even a little of my skin. It is much easier for me to avoid getting ticks in the first place than it is to find and remove them. The main way I avoid ticks is by wearing a Seresto collar. Seresto uses Flumethrin to kill and repel ticks so that they can't transmit a disease to me. If you want to wear a Seresto collar like I do, you can use this link to get a $20 rebate. Great post! We have been lucky this year with the ticks, still keeping our paws crossed! We haven't tried the Seresto collar but we will look into it!